A plant where four workers died early Saturday after a chemical leak has a record of safety violations that dates back several years, a Texas Tribune review of state records shows. The DuPont chemical plant in La Porte, 30 miles southeast of Houston, makes products like alcohol resins and a popular insecticide called Lannate. The workers died after an estimated 100 pounds of the chemical methyl mercaptan leaked due to a faulty valve, the company told local media. Methyl mercaptan, a primary component of Lannate, can cause nausea, vomiting, fluid buildup in the lungs and other symptoms; even in small amounts, exposure to it can be deadly. DuPont spokesman Alan Woods said in an email, "We're working closely with local, state and federal authorities as they conduct a thorough investigation into the incident." State records show that in the last five years, the plant has been cited at least two dozen times by the Texas Commission on Environmental Quality for violating state law. It has failed to perform routine safety inspections, keep equipment in proper working order and prevent unauthorized pollution leaks, according to violation notices issued by the agency. In a few instances, the agency demanded fines of a few thousand dollars from DuPont for more serious lapses. At least one of the previous fines levied against DuPont was issued for a pollutant leak that occurred in October 2009 — also at a unit of the plant that manufactures Lannate. Too much pressure had built up in a vent system, causing a relief valve to open and spew out 3,700 pounds of methylene chloride, a "hazardous air pollutant," according to state records. More commonly known as dichloromethane, exposure to it in high enough concentrations can cause lightheadedness, nausea and vomiting. It's also considered a potential carcinogen. At that time, the TCEQ fined DuPont about $10,300 for failing to prevent the release and for reporting the incident five days late. The company ultimately paid $8,269, with the rest deferred "upon timely and satisfactory compliance," records show. DuPont gave its employees additional safety training after that incident and added more information about potential dangerous leaks to the safety records for its Lannate manufacturing unit, according to state records. But it wasn't the plant's last violation. In August 2013, the company reported that malfunctioning equipment leaked 40 pounds of chlorine — also a component of Lannate that can cause significant health impacts. In March, DuPont told the agency that a gas vent had inadvertently opened and released 110 pounds of the toxic gas carbon monoxide into the atmosphere. In another incident in late September, the chemical plant released 36,500 pounds of sulfur dioxide in three hours, well above its allowed limit. 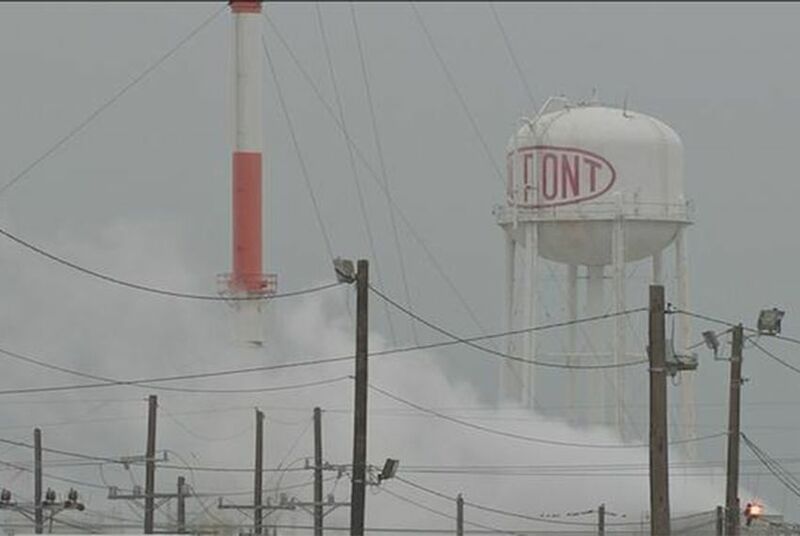 DuPont told the TCEQ that an inexperienced operator had not spotted a malfunctioning valve and that the company was investigating the incident. While sulfur dioxide isn't toxic in gas form, it is a contributor to ozone pollution. The TCEQ reports that DuPont is in "satisfactory" standing in terms of following the state's environmental laws. Spokesman Terry Clawson said the agency's emergency responders are on-site at the plant. "The TCEQ’s investigation of DuPont’s compliance with environmental statutes and regulations will begin in earnest," Clawson said, after investigators determine that DuPont "is no longer in an emergency status." Marcos Vanetta and Alexa Ura contributed to this report.